TheForce.Net - Latest News - Clone Wars Roundtable: Season 2 Premiere! Clone Wars Roundtable: Season 2 Premiere! The Clone Wars series is back! 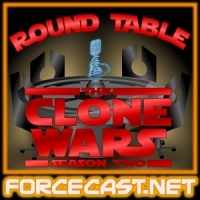 And with it comes the ForceCast's Clone Wars Roundtable podcasts. This week we're looking at the first two episodes of season 2, Holocron Heist and Cargo of Doom. Joining us on the panel are Rebelscum.com's Dan Curto and Director Kyle Newman. Check it out here only at ForceCast.net!